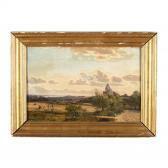 Find artworks, auction results, sale prices and pictures of Henrichsen Carsten at auctions worldwide. 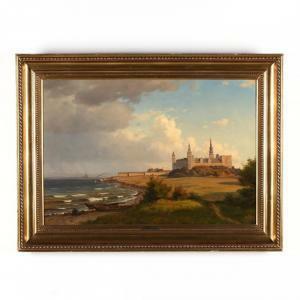 Carsten Henrichsen (Danish, 1824-1897), Kronborg Castle oil on canvas (lined), with artist's monogram and dated 1858 at lower right, presented in a later gilt frame with gallery plaque. SS 19 x 28 in. ; DOA 26 x 35 in. 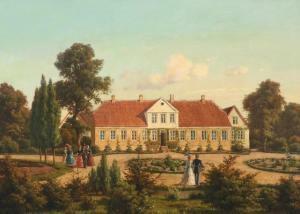 Construction on this grand Renaissance period castle began in 1574. In addition to its historical significance, the castle was immortalized by Shakespeare as Elsinore, the setting for Hamlet. Additional high-resolution photos are available at Leland Little.comConditionFaint stable craquelure; yellowing to varnish; minor nicking to frame. Carsten Henrichsen (Danish, 1824-1897), Udsigt over oil on canvas, dated 1856 at lower left, inscribed on the verso in Danish (Overlooking NÃ¸debo on Lake Esrom), inscribed on the stretcher bar, presented in a period frame retaining remnants of a gallery label. SS 14 x 21.75 in. ; DOA 19.5 x 27.25 in. Additional high-resolution photos are available at Leland Little.comConditionStable craquelure; scatter re-touch visible under UV light; yellowing varnish; canvas with stretcher marks and in need of re-stretching; frame with some chipping and loose joints. 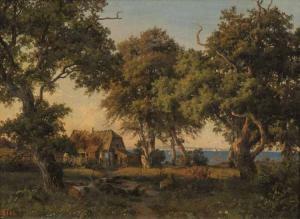 Carsten Henrichsen: A couple is walking by a forest lake. Signed with monogram and dated 65. Oil on canvas laid on canvas. 30 x 39 cm. 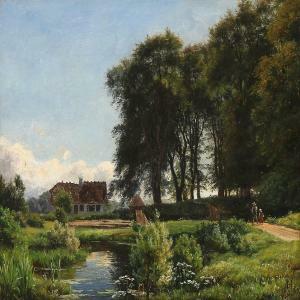 A couple is walking by a forest lake. Signed with monogram and dated 65. Oil on canvas. 30 x 39 cm.